Marriage is a very auspicious occasion and every girl wishes to look stunningly beautiful on that day. It is a lifetime opportunity that won’t come twice. Mahalaxmi Parlour offers exclusive bridal makeup services to everyone who wishes to look extraordinary on the big day of their life. Mansi Saxena, who is an eminent bridal makeup artist in Aligarh, is an expert of grooming the brides who is known to give image makeovers through her majestic makeup tricks. If you truly wish to steal the limelight and every gaze at your wedding day, then you know where to stop. Marriage and Wedding is an auspicious occasion. Whether it’s your own wedding or you are going to be a bridesmaid, the day is big for all. And every girl wishes to look beyond perfect and flawless on the day. 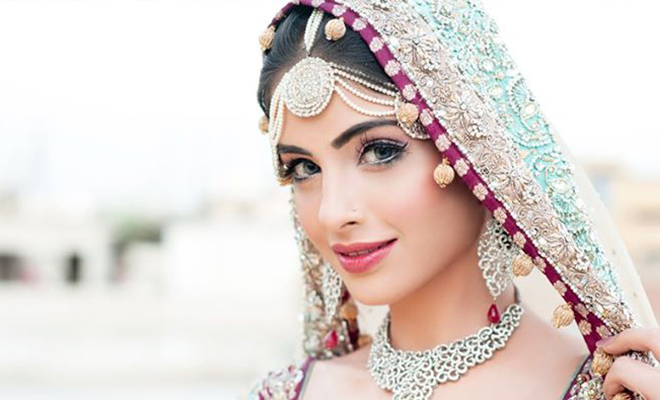 This is where you will need Mahalaxmi Parlour, the hub for wedding makeup artists in India. We help you look perfect for the day without asking for hefty packages and amount. Makeup is our passion and we aim to bring beauty out of everyone by filling some colors on their faces. With the amalgamation of right makeup tricks and branded cosmetic products, we are sure to turn you into a showstopper. So, book your appointment with us today and taste the beauty in an all new way. Going for a party, try out Mahalaxmi Parlour- makeup studio Aligarh, party makeover packages to get charming looks. The salon is run by Ms. Mansi Saxena, who is a well known professional party makeup artist. With huge experience, she will enhance your looks and beauty. These make-up packages will give you very stylish look and you will become the centre of attraction at the party. Choose Mahalaxmi Parlour for the best party makeup artist in Aligarh. Get sensational looks & let every gaze adore you. Our professionals will provide you attractive looks. We can prepare you for different themes & you will look sensational. We use globally recognized cosmetics & brands. In addition to this, we also use advanced equipment so that you will get charming & impressive looks. Our makeover will give you awesome looks for every occasion. The studio is being run by the famous Party Makeup Artist Ms. Mansi saxena. She has total experience of more than a decade in the makeover industry. If you are looking for going to the party, then get the most appealing look from the hands of the expert artist. We believe that makeup not only helps in improving your external beauty but also helps in making you beautiful from inside. It boosts your confidence level. We provide theme based makeover so that you will stand out from the crowd. Ms.Mansi Saxena has vast experience of this field and she knows fully well how to make you look more beautiful. Career Grooming might look like a superficial thing because there is technically no specific method or direction, using which or going that path can help one structure their career. So it is like a personal satisfaction thing where your education ends up giving you a job which you like the most. In fact, that is not always the case for most of the people around. People generally realize the right career path after having past two or three initial years of their professional life. The first step towards grooming one’s career is to learn a skill from best beauty institute in delhi which one’s love to practice and which also has the right financial incentive to pursue. With the opening up of the health and beauty industry which has structured the industry in a professional way and created new job opportunities have started attracting a league of new age professionals. A beauty parlour course is actually the initial bridge to understand the industry and attain the basic skill to enter the industry. The best part of a course like this is the mix of practical and theoretical element in it. The skill that is attained through a course like this can actually supercharge one’s career. People generally don’t just learn the technical skill but also have to face real client case which gives one a broader view of the career. Attending a beauty parlour course can not only get someone the desired job but people can actually start their own venture. This is not the case of other educational courses. A proper beauty courses in Aligarh can empower a new age employee to become the right professional from day one which a lot of people learn after two-three years of their professional careers. The varied range of skill one learns under the beauty parlour course can help a person to understand and ponder the right career path. But the question here is around finding the right Make up classes in Aligarh . There are a lot of institutions offering courses in this space. Ranging from traditional educational institutions and institutes run by industry experienced beauty professionals. Plus there are short term and long term course. If one is looking into something which can give a concrete structure to one’s career they need to select the right beauty parlour course. Plus the soft skills learned during the process of training under beauty parlour course can help one to handle professional life in a much better way. In most other professions people generally in their first job get a lot of culture shock but a beauty parlour course is structured in a way that there is less of it.A good course followed diligently under the guidance of the right mentor can help a person grow in their career fast.